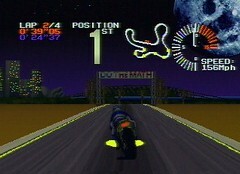 Certainly not the most innovative racer, nor the deepest, Super Burnout is nonetheless a very good game. It embraces most of the beloved traits of racers from a different era, while jettesening the bulk of their annoying qualities. It has a comfortable feel, and appeals to my "old school" sensibilities while at the same time not feeling like a simple rehash. In brief here is a summary of the game, and the reasons why I (and my other jag gamers I'm sure) hold it in high regard. Super Burnout features 8 tracks that take you the world over. The courses aren't especially large, but this is still a step up in choice from some comprable games of the time. It allows you to select from 6 bikes with varying abilities. Again, this is more than offered by some. 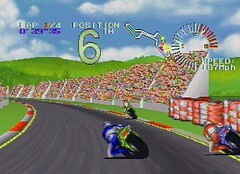 You have customability over the number of laps and the difficulty. Standard stuff here, but wisely not ignored. The graphics in this game fare well, for the simple reason that they grow on you. Rather than having an initial "wow factor" that fades with time, Super Burnout succeeds by doing things that are often ignored but quite important. I appreciate Super Burnout's colorful and clean visuals. I appreciate that it can move as quick as it does (it really is quite fast) and still have pop-up be a non-issue. I appreciate it's effective use of day and night cycles, and they way they gradually change on some courses. It really is a nice looking game, that updates the look of 80's arcade classics without being overly ambitious to try and take full advantage of the Jag's hardware. The audio end doesn't get as much positive press from me, for the simple reason that I struggled to remember it. One could argue that this isn't necessarily a bad thing (the music obviously didn't annoy) but I feel that this does not reflect well on the Jag. The system has a few notable musical treasures (Tempest, Defender, Atari Karts) but this is certainly the exception and not the rule. Upon re-boot I found the tunes in Syper Burnout to be perfectly acceptable, but having nothing to differentiate them from 16-bit consoles. The sound effects likewise were very average. There is a mode where you can sample both though, and this extra may appeal to some. Control is where this game is at it's best! It controls tight, and exactly how I would expect it to. I never felt the game was at fault for a scrape or (random worst case scenario) a crash. Nobody to blame but me. Still, I wouldn't hesitate to reccommend a bike that favors grip over max speed. 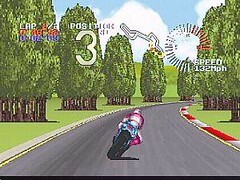 Regardless of your choice though, I think we can all agree that Super Burnout controls very well indeed. One of my most re-visited Jag games, Super Burnout is the ideal pick up and play title. It doesn't need much depth when you can sit down for a quick race and have so much fun! Wanna lengthen the experience? Try to beat the course records, nicely memory saved (which still works on my copy) Or go for a two player marathon (anyone think the zoom is too close in this mode?) Along with the excellent Power Drive Rally this is a first-rate racer, and a title that I wouldn't mind showing off to company. 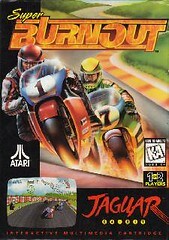 Super Burnout is one of my top 5 Jag games, and a must own for any who have overlooked it. Last edited by Trev on Fri Nov 02, 2012 10:11 pm, edited 2 times in total. Nicely detailed review! I look forward to your future ones.